Over the last week, at least ten separate attacks against Palestinian citizens of Jerusalem have been carried out by settlers. Many of them targeting children and youth. A group of settlers attacked three Palestinian men from Al Musrarah neighborhood, near Damascus Gate in the Old City. While they were driving their vehicle in Jerusalem, the settlers broke the glass windows of the vehicle and flattened the tires with steel bars and then physically assaulted the three men. As a result 22 years old Ahmad Al Ghoul suffered from a bleeding in his eye. In a similar case, a group of settlers flattened the tires of many cars parked in the Palestinian neighbourhood Beit Safafa in Jerusalem and wrote racist slogans such as “Kill all Arabs” on the cars. Another group of settlers assaulted Arab workers with sticks, steel bars and burning gas while they were working in “Mahaneh Yahoda” vegetable’s market. This came in addition to the stabbing of a young Palestinian worker while he was working in a gas station in “Pizgat Ze’ev” settlement by a group of settlers. The young man had to be transported to Ain Karem hospital for emergency treatment. In Silwan, another historic Palestinian neighbourhood in Jerusalem, a female settler broke into the house of 57 years old Nema Abu Hadwan and sprayed her with pepper gas while she was sleeping. Another group of settlers assaulted the two 15 years old kids Bara’a Abu Sneneh and Sahar Khalifeh from Silwan and dragged them to the Jewish Neighborhood in the old town while they were walking back from their school. Moreover, the 19 years old Mahmoud Issam Obaid from Al Isawiyeh was assaulted by a group of settlers as he was walking near the “French Hill” settlement while going home. In another attack, in west Jerusalem, a settler intentionally ran over the 14 years old Khalil Khames Al Kiswani with his car and dragged him until he suffered from several fractures in his left leg. In a similar case, a group of settlers has attacked the 25 years old Islam Obaid through assaulting him from behind with sharp tools on his neck while he was at work in Deir Yassin. And last, the young Palestinian Ayob Jaradat was hit by a car intentionally by a group of settlers in Jaffa Street in Jerusalem. Ahmed Sawafta, 43 years old, was killed last week by a bomb left behind after Israeli military used the area in the north of Jordan Valley for trainings. This is not the first time a shepherd from the Jordan Valley is killed this way. Since years the Israeli occupation forces conduct military training in inhabited areas in the northern Jordan Valley in order to force the Bedouins to leave their homes and communities. Three months ago another shepherd was killed in that area in the same way. Three settlers from “Meskyot” settlement chased the 20 years old Hilal Daraghmeh from Al Maleh Valley and beat him until a patrol of the occupation army came and arrested ... the assaulted young man. This occurred while the settlement construction works continued in “Meskyot” settlement in Ain Al Hilweh area at the expense of the Palestinian lands. At the “Atsyon” road block, north of Hebron, a settler stopped the car that the 23 years old activist Monther Ziadeh was driving. A group of settlers dragged the youth, active in the Youth Against the Settlements movement, dragged out of his car. Monther related how they beat him in an attempt to kill him. All the while, Israeli military was by-standing and watching. Finally, they put a knife in his car while he was lying on the ground in order to accuse him of being the attacker. Another group of settlers from “Nahal Naghot” settlement that is built on the Palestinian lands of Dura village tried to kidnap the 11 years old child Amir Taha Abu Sharar from Afqiqees village, west of Dura village. Luckily the attempt failed as people from the village noticed the attack and rescued the boy. A group of settlers burned parts of the home of the 54 years old Huda Abd El Ghani Abd Al Raheem Hamayel in Al-Sha’ab neighborhood in the north east of Ramallah. 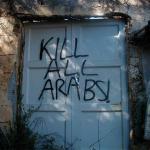 They wrote as well racist slogans against Arabs on its walls and broke the glass windows and threw tear gas and stun grenades inside the house.